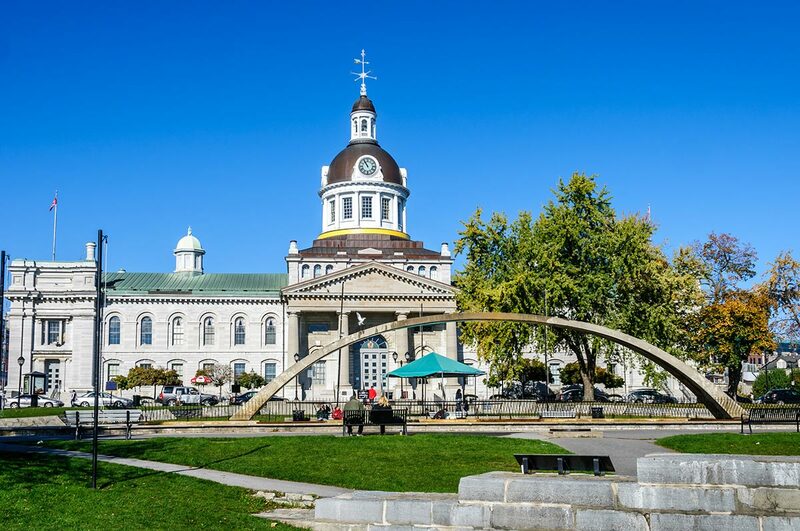 Kingston is safe, inexpensive, and clean – 3 reasons that are hard to find in other cities. As a world-class cultural center, you’ll find so many things to see and do, real estate prices are more affordable than Toronto, and major places to visit would frequently be a little over 10 minutes of commute. This city of 159,561 residents for the Greater Kingston (as of 2011 census) was ranked 11th best city to live and 3rd to retire in by MoneySense magazine in 2014. 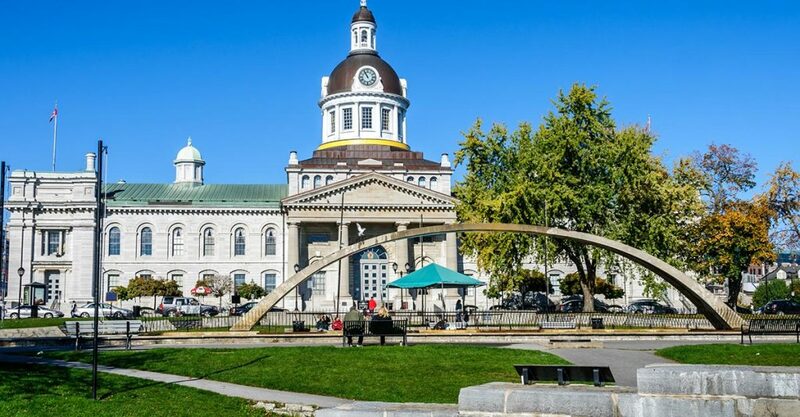 With an average household income of $83,515 and average home price of around $300,000, people living in Kingston have many things to be happy about. Kingston is halfway between 2 important Canadian cities – Toronto and Montreal. If you ever wish to make a trip to Toronto, it is about 266 kilometers, or a little less than 3 hours’ drive. 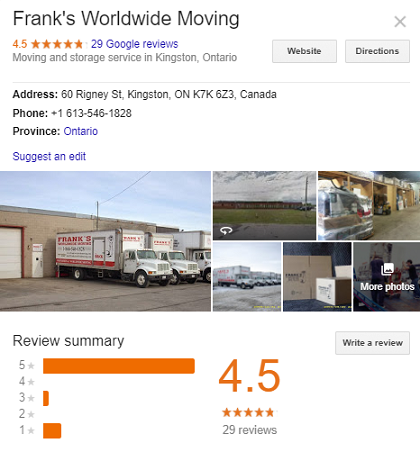 If you are moving to or from Toronto, professional movers will consider that a long distance move. Before you can enjoy a new life in Kingston, you’ll need to plan the best way to relocate from your current location. Worried about the cost of moving? The good news is that professional moving services are so flexible you can totally customize your move to suit your budget. Moving is fun and exciting. But it can also be traumatic and stressful. Packing up everything you own in boxes, disassembling and assembling furniture in 2 locations, and loading them to a vehicle to drive a long way is way too exhausting for any one person to do. If you are moving a 2-bedroom house with only a friend to help, you’ll probably wish you never made the decision to move. So why are you taking on all the hard work by your lonesome? Most people decide to move DIY because they believe hiring professional movers will cost too much money. Hiring professional movers means spending money but with the right moving company, you can save on costs and choose only services you need. Further, you don’t really get to save that much from a DIY move because you’ll be paying for what you need anyway, such as a moving truck, equipment, fuel, and moving labor. Even if moving labor will simply mean feeding your friends pizza and buying a couple of rounds of drinks. So let’s take a look at what it would cost to make a DIY move from Toronto to Kingston. Advertised rates for rental trucks can be deceiving at $19.95 per hour for a local move. What it doesn’t say is that it’s only for a pick-up or cargo van. If you have furniture and more stuff, a 15 ft. truck costs $29.95 and a 20 ft. truck costs $39.95 per hour. If you get your U-Haul 20 ft. truck in Toronto for drop-off at Kingston (24-hour drop-off), you’ll pay about $839.00, with other add-ons. With a truck rental, you are responsible for fuel and mileage. Consider these costs on top of your moving truck rental. Other add-ons could be rental for moving equipment such as furniture pads, dollies, allen keys, moving supplies, trailer, car carrier, etc. If you decide to get moving labor to help you with loading and unloading, that’s going to cost you more. With a DIY move, there are more risks you’ll need to consider. Check if your homeowner’s insurance provides coverage for your household goods during a relocation. Consider these moving insurance quick facts to help you determine if you need insurance. On top of these costs, bear in mind that you need to return your truck rental after your move. After a long and tiring day of loading and unloading, you’ll need to drive again to your drop-off location. DIY Moves are definitely not easy and are not for everyone. Compare DIY moving with moving with professional moving companies to arrive at your best moving options. There are different kinds of moving services to choose from. Your choice should be based on your moving needs and how much you can afford to pay. It is entirely possible to have a semi-DIY move to reduce moving costs with a professional moving service. What are your DIY moving options with a professional mover? Moving companies calculate the cost of your move in 2 ways. For local moves within Kingston, you’ll be charged hourly rates which already include your moving truck plus 2 or 3 movers. For a 2 to 3-bedroom apartment or home, you may choose from 17 ft., 20 ft. or 26 ft. truck. Movers have different hourly rates based on truck size and number of movers. You can reduce the hours it takes for a moving company to complete your move by doing your own packing. In this case, movers will simply take care of loading and unloading your furniture and moving boxes. Moving companies offer low hourly rates, for example, $90 to $110 per hour. These rates include your truck plus the men you need to help load and unload. These rates also include free use of shrink wrap for your furniture, dolly, moving pads, floor runners, and tools for disassembly and assembly. You pay for almost the same amount for these charges but you don’t have to do all the hard work. Many full-service movers offer economical self-moving options with portable moving containers. They provide portable containers which you can load by yourself. When you are ready, the moving company will pick up your moving container and deliver it to your new address. The charges for this self-moving service is calculated based on the size of your moving container and the weight of your inventory. If you are making a long distance move to Kingston from Toronto, Ottawa, Montreal, or Calgary, don’t lose heart. You also have cheaper long distance moving options to Kingston. ✓ You can obtain a moving container for your household goods for your Kingston relocation. One important requirement is that you have available space in your front lawn for the portable container. ✓ Moving companies also offer flat rates for door to door delivery of your household goods by moving truck. Movers will load and unload your goods and deliver them to Kingston on the same day (depending on the distance of travel). ✓ If your household goods are less than 2000 pounds, many moving companies offer consolidated moves (meaning you share a moving truck with another individual). It may take longer to deliver your cargo but if you are in no hurry, it costs much less than an expedited move. Speak to a moving company about affordable moving options to suit your budget. Reputable and experienced movers understand you are worried about moving costs and they will work with you to bring down your moving expenses. You can connect with 5 best moving companies in Kingston with our free and no obligation moving quotes today. Some people are willing to pay a little more to ensure that they have zero-stress during a relocation. Their priority is to be able to meet time constraints for a move, obtain professional help in packing and unloading, and get their household goods safely and as quickly as possible to their new city. Many premium moving companies offer a complete line of moving services to ensure your move is zero-stress. They can provide the movers you need to get everything done on moving day and safely deliver your household goods at the fastest time possible. They provide partial or complete packing and unpacking, loading and unloading, assembly and disassembly of furniture, appliance servicing, and crating of art and other collectibles. Larger moving companies offer other specialized services such as piano moving, pool table moving, hot tub moving, vehicle relocation, etc. It may cost you a bit more than a DIY move or an economical move. However, if your inventory includes large furniture, valuables like antiques and fragile items, it is advisable to entrust them to a professional moving company. Licensed moving companies carry adequate insurance for the protection of your household goods during relocation. Get the complete low-down about DIY moving with U-Haul vs. moving with professional movers to help you make the best decision. Before you can choose a moving company, you’ll need to know how they differ in services and moving rates. You should know that cost is not the only factor to consider – think about the moving company’s experience, reputation, insurance, and quality of services. You get what you pay for; saving a few bucks may not be worth the stress and aggravation from hiring an undesirable moving company. Below are 7 well-established moving companies serving Kingston and its surrounding neighborhoods for residential or commercial moving. This family-owned moving company has been serving Kingston for more than 25 years. It is big enough to provide you with every kind of moving service – logistics, labor, transport and storage. Yet, it is small enough to give personal attention to your move. As a member of Great Canadian Van Lines, it has the network to relocate you anywhere you need to go in Canada, the USA, or abroad. It is a full-service mover specializing in residential moving. It is also knowledgeable in piano moving. Local moves are charged fixed hourly rates but large moves can be quoted flat moves, too. They also deliver to and from Ontario, Quebec, and New York regularly. 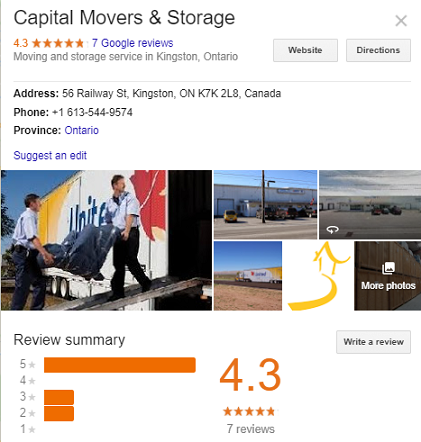 Walker’s Van & Storage and Capital Movers & Storage believes in exceeding customer expectations with excellent service. In partnership with United Van Lines, it gives customers flexibility in their moving choices. You can do your own packing and they can transport your household goods. You can also choose to let their movers tackle everything from packing to loading and delivery. This moving company specializes in residential moving, commercial moving, professional packing, senior relocation, and storage. 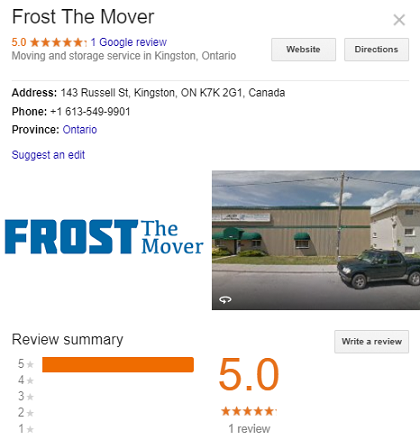 It has 4 Ontario locations – Trenton, Kingston, Deep River, and North Bay – to provide you with high-quality moving services. 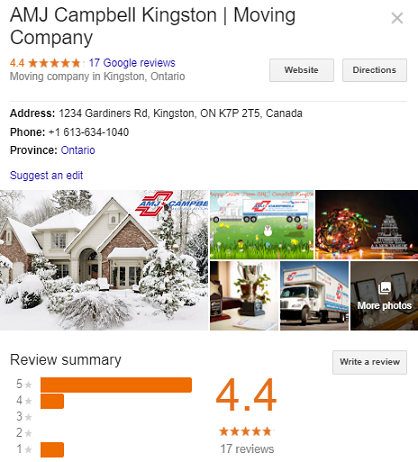 This moving company is the oldest mover in Kingston and was recently honored by North American Van Lines for 40 years of high quality services. Since 1905, it has developed a reputation for great customer service and professionalism. As a full-service moving company, it specializes in relocating families and offices across Kingston, Canada, and even the world. It is a member of the Canadian Association of Movers and is in good standing with the Better Business Bureau. 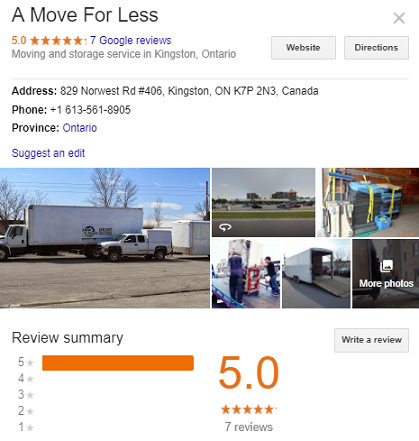 This Kingston moving company offers moving truck and 2 movers for $80 per hour (minimum of 4 hours). They conduct household moves in Ontario and Quebec. They provide a 24 ft. enclosed moving trailer which is suitable for moving up to a 3-bedroom home. The company also has a 28 ft. straight moving truck. The company also provides piano moving, packing services, commercial or office moving, deliveries, and storage. 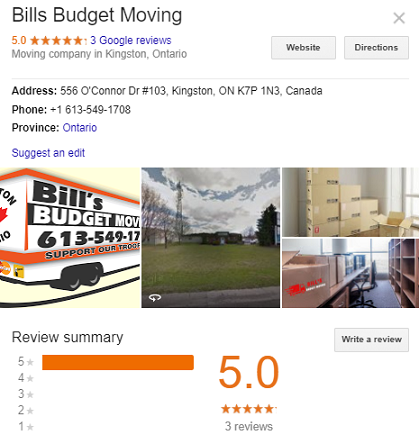 Bill’s Budget moving is a trusted mover in Kingston. 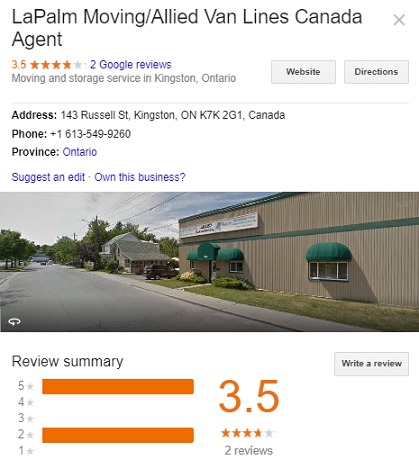 Serving Kingston and surrounding areas, it provides residential moving, commercial moving, and packing services. For moving rates, they offer $125 per hour for 5-ton truck and 3 movers, $85 per hour for 1-ton truck with 2 movers, and $75 per hour for 2 movers no truck. All rates have minimum of 4 hours plus HST. The company has been in business for over 17 years and carries appropriate insurance. It provides senior, student, and military discounts. The name AMJ Campbell has been around since 1934. This moving company belongs to one of the largest and most successful moving organizations in Canada. AMJ Campbell Kingston is operated by FGI, the largest franchise in the network and has branches in Toronto, Peterborough, Ottawa, Pembroke, and Kingston. It also has storage facilities in Barrie, Ottawa, Petawawa, and North Bay. Its services include household moving, commercial moving, international moving, warehousing and storage and special products moving. Established in 1915, this moving company is one of the oldest moving companies in Canada. It is a member of Allied Van Lines, one of the largest moving networks in the country. Being part of a large moving network, this moving company has the resources and expertise to relocate you in Kingston, across Canada, or the world. Like most movers, they calculate local moving costs based on hourly rates while long distance moves are calculated based on weight and distance. This company can also move you to the USA. These are just some of the many moving companies serving Kingston that could help you relocate to Kingston. 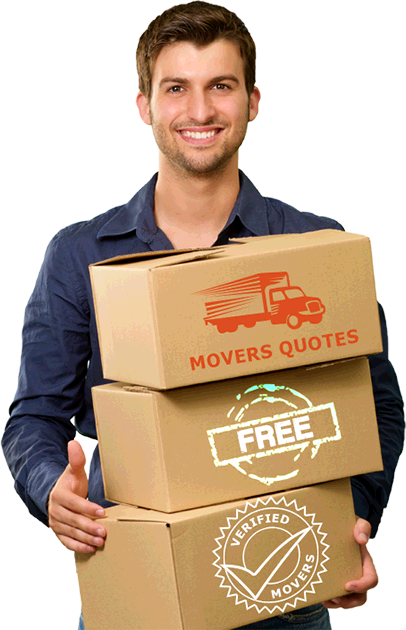 The best way to choose a moving company is to compare multiple movers with free moving quotes. Request for 5 moving quotes today using our quick online request form. To have a stress-free and efficient move, the first step is to hire a good mover. How do you spot a good moving company? The most common moving complaints from consumers include jacked-up moving prices, a different mover showing up on moving day, household goods held hostage, and delayed, lost or missing goods. Most of these bad experiences result from hiring the cheapest movers without checking on the company. These unethical practices are things a reputable and trusted mover will never do because they violate standards of practice in the industry. You can avoid being a moving scam victim by hiring only reputable movers. For your own safety, you can verify a professional moving company from the Canadian Association of Movers or the Better Business Bureau. Don’t hire a moving company based on price alone; always check the company’s reputation, experience, customer service and reviews, and other relevant qualifications. If it is too good to be true, it’s probably not true. If you are looking for a good moving company, you should take advantage of free moving quotes. These no obligation quotes connect you with the best movers near you so you can choose the right one. Our moving partners are all licensed and insured so you have peace of mind about the safety of your household goods. Take 2 minutes to fill-out our online request form today to get competitive quotes from 5 moving companies in Kingston. A pleasant and smooth relocation to Kingston awaits you with any of our moving partners.